It was Lis’ bike split that put her out of reach of the other competitors in her age group (which is typical for her – at IM FL she went sub 5hrs WITHOUT drafting), and out of reach of all but 7 other amateurs (all under 35). This while forcing herself to be conservative and save something for the run. I count six AG women with faster bike splits, which for Lis is “mediocre”. But it was obviously still quite good and combined with a decent swim and run, it was good enough for a 10min margin in the AG. Her run was better than it looked as there were several bathroom stops and every aid station was walked. So her running pace averaged well under 8min/mile net in blazing heat. While the crosswinds coming back from Hawi were not very bad this year, the riders endured a wicked and strengthening cross-headwind heading back to town from Kawaihae to the airport – about 25-30 miles. It was essential to be aero, comfortable, and relaxed to make the most of these conditions. Lis has been riding Kestrel’s since 1993, and airfoils for about the past six years. This year she was lucky enough to get an Airfoil SL Special Edition. This is a pricey bike (although the Ultegra-equipped SL gets you the same frame for half as much), but it is race ready right out of the box. You get custom matching Zipp 404 clinchers and a Zipp Vuka integrated bar setup. So she has been riding this bike bone-stock all season to smoking bike splits. The Airfoil has been around in various iterations of its unique seat-tube-less design for a while. Recent wind tunnel tests (by Kestrel) show it to be comparable to the P3c. The one question I always had was its lateral stiffness. 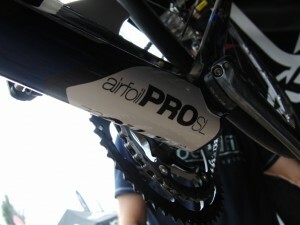 For 2009, Kestrel massively beefed up the lower portion of the down tube and the bottom bracket cluster. I finally had the opportunity to ride one when I built up a 59cm for a friend. I didn’t ride it very many miles, but I was able to switch back and forth between my P3c and the Airfoil several times – and I had each set up identically fit-wise. I was pleasantly surprised to find that the Airfoil felt at least as laterally stiff as my P3 – maybe even stiffer, which really surprised me. Training-bud Vinu also switched to an Airfoil this year from a P3c, with some reservations at first. He no longer misses the P3. Although Lis’ bike is mostly stock, we did add a few goodies. She ran a Speedfil unit for hydration, and was lucky enough to receive a prototype silver “Speed Sok” from Mr. Speedfil himself, David Dietterle. I will have a separate writeup on the Speedfil, but in general we have been very happy with them. They are a good alternative to an aerobar bottle, holding more fluid (40 oz) while centering the weight over the BB instead of out on your bars. They also don’t splash sticky stuff all over you. They are certainly more aero than a round bottle, they are easy to fill and easy to drink out of, and the Sok is a neoprene insulator which helps keep the fluid cool. The reflective silver Sok seems to work even better, and it will be available soon. Most athletes configure their Speedfil drinking tubes to stick straight up, like the straw of an aerobar bottle. Lis and I prefer to keeps our tubes between the bars, out of the wind most of the time. We can easily flip it up for a drink. The tube sleeve has a bendable wire which holds the tube in the last position and keeps it from flapping in the wind. And seeing as the MIT boys found a short section of vertical straw could cause as much drag as your front aero wheel saves, we’ll keep our tubes hidden. For rear hydration she used an ISM Quick Draw. Unfortunately some of these have had durability issues so they are in redesign right now. Durability aside, they work very well and appear to hide the bottles better since the cages are angled and the bottles overlap each other in a “V”. On the top tube she has a Fuel Belt aero fuel box. I came up with this variation on the rectangular bento box a couple years ago. Is it really more aero? Not sure. But I am certain it is more aero than no box at all, and the new new Trek Speed Concept TT bike uses a similar shape to blend the top tube into the stem complex. The Fuel box has enough room for a tube, CO2, a pill flask, tire irons, and a couple gels. Her bike has the stock full SRAM Red grupo which works impeccably. Pedals are Keywin CRM Ti which are very light yet have large platforms. I set her up with -3mm axles (narrows her stance by 6mm vs regular pedals) which fit her close-to-the-frame pedaling style better than standard width. 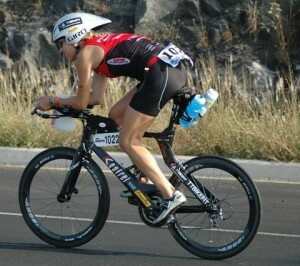 Up top she used a Rudy Project Syton open aero helmet. 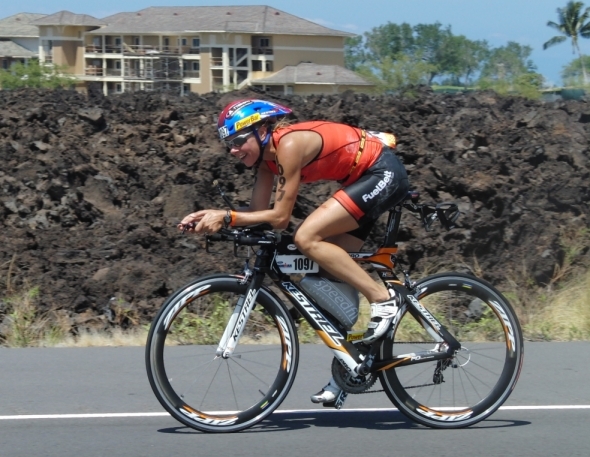 Maybe not the most aero helmet out there, but she felt it was far cooler than her Giro Advantage II, and maybe the best compromise for Kona’s heat. Shoes were Specialized tri shoes, which I have also used for a few years now. These work very well for folks with wider forefeet, and they have a small amount of varus wedging built in which works well for most riders. Tires were Vittoria Open Corsa CX 20mm inflated to about 120 psi. It is tough to beat the ride quality of these tires with 320 tpi. Neither of us use power meters or HRM’s. We do believe in the value of PM’s, but have had had other priorities for the ~$4k it would cost to equip both of us with them! We both use ISM Adamo race saddles, and have for over two years. We have them on our indoor trainer bikes too. Once you switch, there is no going back, at least for aero position. I have been amazed at how many folks have taken to these saddles on out team, even old-school types. If they are set up properly, they are tough to beat for all-day aero comfort. That’s about it – I must be forgetting something… oh yeah her FIT! 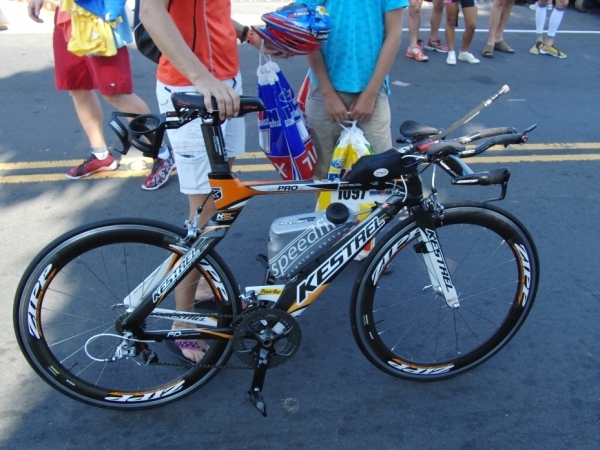 We set Lis’ current bike up exactly like her prior Airfoil (which she rode last year in Kona). Her old one was a 52cm with 650c wheels, and her new one a 54cm with 700c, but the contact points are identical. Lis takes to a very aggressive aero position quite naturally, so the low stack-long reach Airfoil is perfect for her. She is about 5′ 8″, but uses an aggressive-for-her-size 14cm of drop. We did shorten the stock stem by 1cm – the Airfoil is very reachy and the 54’s reach required a 90mm stem to work for her. Needless to say she uses about a 79 degree effective seat angle to facilitate power production with this fairly hefty drop. Certainly Lis’ high power-to-weight ratio is key to her great bike splits, but the fit and equipment have to be there too, and her current setup fits the bill quite well. Look for my thoughts on the new Kestrel 4000 here soon – I promise.